Pink Val Max Dress 9060 by Pink at Blood of The Young. MPN: SKU-F0527B49. Hurry! Limited time offer. Offer valid only while supplies last. Val Max luxurious sleeveless dress in pink. Make your little princess belle of the ball in this stunning dress. 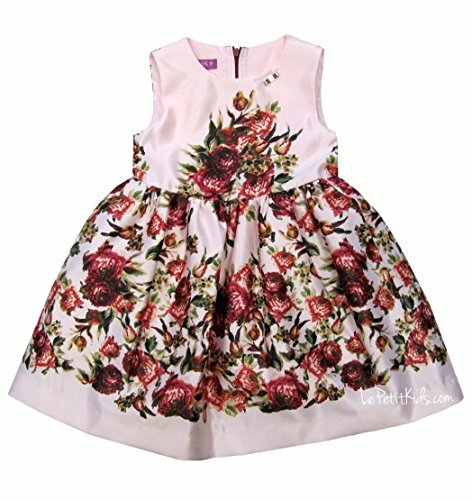 Solid pink with stitching detailed gorgeous rose print. Round neckline with attached Val Max metallic bow. Beautiful gathered three layered skirt has thick tulle underskirt with dark red satin trim finish. Dark red trip around the back zipper. Dress is fully lined in powder pink colored cotton lining. Made in Italy. If you have any questions about this product by Pink, contact us by completing and submitting the form below. If you are looking for a specif part number, please include it with your message.